Hi y’all! I just wanted to catch y’all up on all the craziness that’s been going on in our world. We just finished our flip house (I’m sure you saw on my IG stories), schools back in sesh for my little 1st grader and we are currently gearing up for Channing & Triston’s birthday. Alot of planning has to happen when your kiddos birthdays are a week and a half from eachother, but I’m so excited to celebrate these sweet little babes. 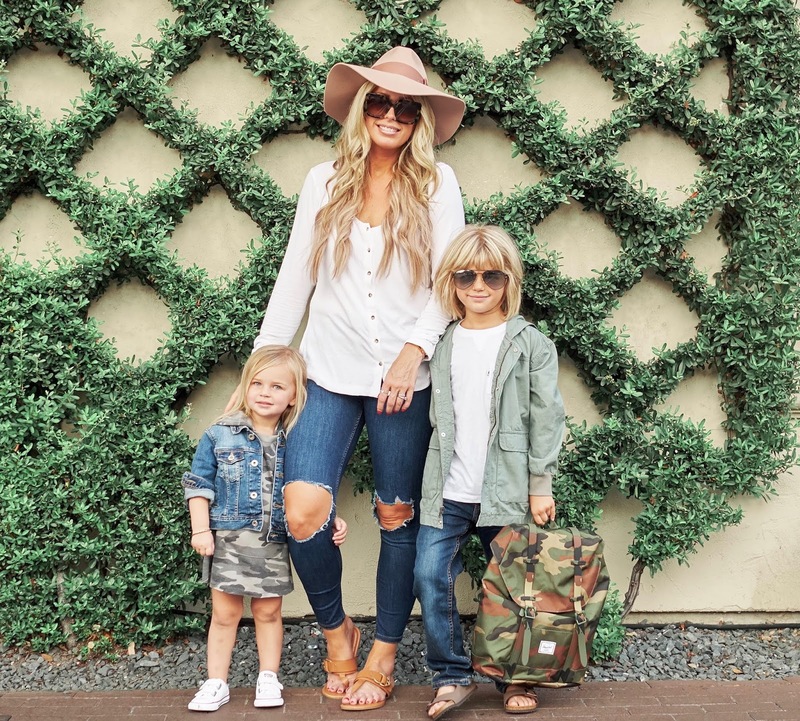 Today I’ve partnered up with Nordstrom to share one of my favorite capsule outfits for your little’s this season. When I look for capsule piece, I also make sure they are comfortable, but flexible pieces for my kiddos. I typically make sure I can mix and match the pieces into multiple outfits and seasons…which in turn helps me save money and I’m all about it. 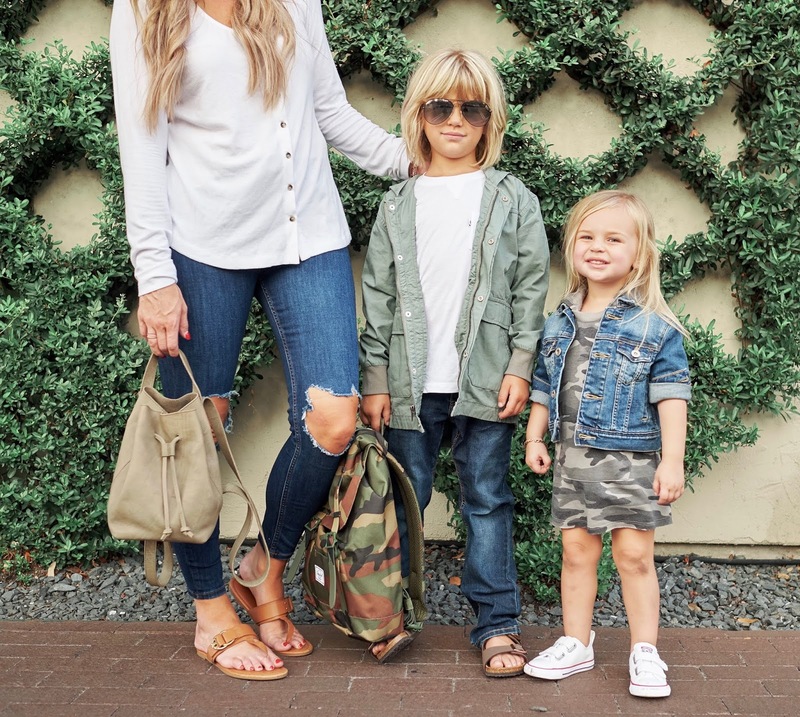 Nordstrom currently has so many perfect capsule pieces for your little nuggets wardrobe. One of my favorite pieces the kiddos always have in their capsule wardrobe when transitioning into fall is a lightweight jacket. As we know in Texas, it might be 100 degrees outside…so, every store, movie theater, restaurant in town will over compensate for the heat & cranks up the AC to -10 degrees. lol Sad, but true. So, for that reason, I always keep a lightweight jacket that can go with most outfits in the car for my little nuggets. My son LOVES this olive lightweight jacket from Nordstrom that’s under $50. There’s just something about a hooded jacket that makes every kiddo feel like a super hero…or is that just my kiddo? lol I love this jacket since he will be able to wear this all season long and even into Spring (again, getting my monies worth on this baby). Also, this $25 basic tee gives me life…why, because it literally goes with everything!!! Triston can wear it paired with slacks, athletic shorts, a blazer for church and even a casual pair of denim jeans for school. And can we talk about Channing’s outfit?!? I die! And I need this camo dress to come in adult sizes! Channing calls this her princess dress…hey, works for me. If you have been following me for a period of time, clearly you know our fam loves us all things camo. This dress is perfect for RN. It’s actually lightweight and has long sleeves. 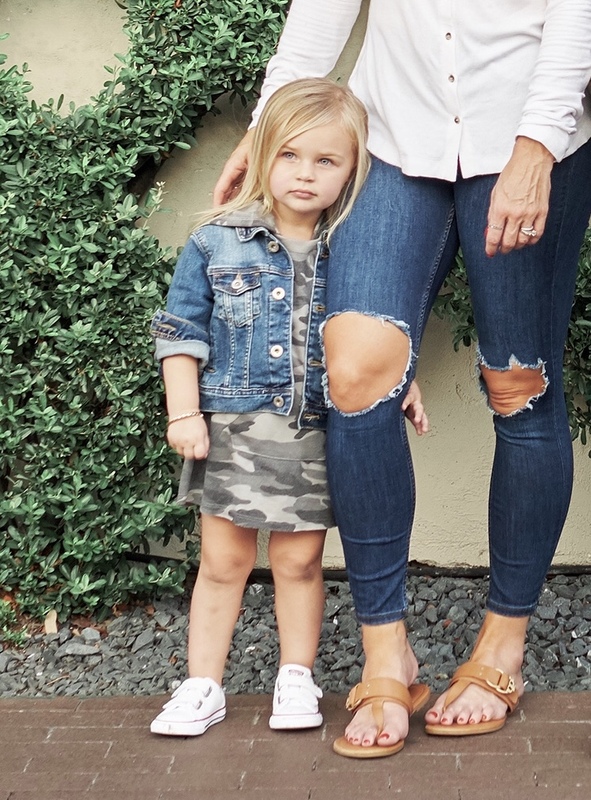 I rolled up her sleeves & paired it with her favorite sneaks (or you can add your little’s favorite brown sandals for summer or booties in the fall). Transition into fall/winter and you can add black leggings, brown boots & this denim jacket to stay warm…and maybe an adorable beanie. OK, did you notice the kangaroo pocket in the front? How adorable and functional is that to keep your little’s hands warm for fall & winter….or in her case, sneak her gummies when her bub tries to snag them…i kid, i kid…not really. Again, send me this dress in my size!!! This dress is under $50 from Nordstrom and can be worn year round! I thought I’d give you one of my favorite capsule pieces that is currently in my wardrobe. Eventhough this top is not a camo piece, it’s affordable ($38), comes in multiple colors…and the best part is that it’s a must have for layering for the fall/winter. And since it’s not quite fall yet, I love that it’s so lightweight, it’s perfect for life RN. I have to admit, I even wore this top to bed with my sleep shorts and a cardi last night. You could even unbutton it and use it as a cardigan. Flexible piece FTW!!! Also, these denim jeans are a must and will continue being on repeat all fall and winter. These jeans are not only trendy, but they have a little stretch, which is nice after a really good meal. I mean, not made at it. And since we love to splash in camo, these are a few of my camo faves! I love all of these! I was thinking of getting Maddox some new clothes and a capsule wardrobe is the best idea! So adorable. I need to get on this too! Would be so much easier to pick their clothes every day. Looove Nordstrom’s kids clothes! Same here! They have so many good options.